Dive into the fascinating world of the ocean and let the voices of the sirens lead you to hidden treasures that will leave you breathless. Experience the surreal beauty of an Ancient, mythical underwater world, capable of inspiring even the heartless into wonder and pleasure. 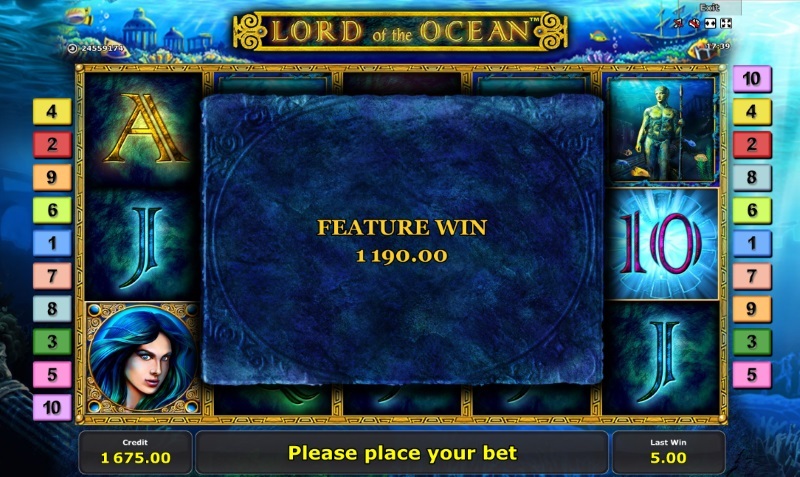 Lord of the Ocean is a slot game based on Poseidon’s famous legend. The graphics and the sounds used in the game will simply transport you in the Kingdom of Poseidon. Be brave, and you will be rewarded. Make the big plays and go for the big spinning scatters. The slot has 5 reels and 10 paylines, as most of the slots have these days. The paylines are running from the left to the right. The main objective of the game is to land on at least 3 identical symbols, aligned from the left to the right, on any of the paylines that you choose to bet on. The game is filled with symbols that are aligned with the main theme of the game, like ancient statues, treasure chests and even the image of mighty Poseidon. The smaller bet that you can play on is 4 credit scores, while the maximum bet is 1000 credit scores, but this can, of course, vary depending on the online casino where you choose to play Lord of the Ocean. Once you settle on the pay lines that you wish to bet on, set the bet hand and wish yourself good luck, press Start and play! The biggest win the game can offer is 50,000 credits, which is only available if you’re willing to bet only with the highest possible bet of the game. Still, there’s no reason to not play on lower bets either, as the chances to win are still pretty good. Why? Because the slot has a Return to Player percentage of 96, which is among the best of the best in the industry. Poseidon was the god of horses, earthquakes and the sea, but also one of the gods that could live on Mount Olympus, home of the Ancient Greek gods. He was the brother of Hades and Zeus. These three gods were simply splitting the Universe among themselves. After splitting the aquatic land, the underworld and the heavens, the Olympians decided that the Earth should be ruled by Zeus. This is when several disputes between the gods took place. This is where Novomatic got its inspiration and created the famous Lord of the Ocean. The main theme of the slot is the underwater medium. The players submerge into an oceanic landscape, which is pleasing to many of the gambling aficionados. The visual aspects that the game is offering perfectly blend with the unique sounds, making up for an amazing experience. Lord of the Ocean comes with a great bonus round. In order to activate it, all you have to do is land on a combination of 3 or more Scatter symbols. These could be the Golden Amulet, but also other special symbols. Landing on three or more of them will open the bonus round, which will grant you with 10 free spins. During the spins, your credit score will stay the same, while any wins will be of course added to your overall credits. Lord of the Ocean has many special symbols, like Wilds and Expansive Wilds, Scatters which bring about Free Spins and so on. All of them are meant to raise your chances for a better win. The symbols include Treasure Chests, Goddesses, Poseidon himself, Warrior Amulets and so on. The rest of the symbols are the classic ones, like A, K, Q, J and 10 from a normal deck of playing cards. The Wild Symbol you need to look for is Poseidon, which can take the place of any other symbol except for the Amulet. You can raise your chances for a win by using a Special Scatter Symbol. If you are lucky enough to land on one during the free spins session, this symbol will simply fill the reel and award you with a huge win. You can also choose to play on an automated spin strategy, and if you land on a free spin round while doing so, you’ll get an additional 10 free spins just for that. As always, please consider playing only money that you can afford to lose while gambling. If you feel like the game is turning into an addiction, turn to a professional immediately.